Chiropractic care is a way to restore motion in the body, making sure your nervous system is working properly in a balanced way. Through a properly aligned spine, your brain can communicate with every cell and organ in your body. Imbalance can cause pain and interference that can lead to heartburn, headaches, low back pain and other uncomfortable symptoms. Decreased motion as we age can lead to symptoms and discomfort that get in the way of your greatest potential and life. 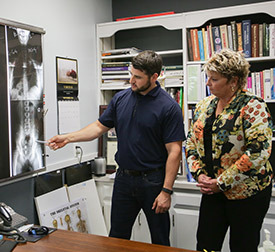 Dr. Brad explains how chiropractic care can help. When our chiropractors adjust you, they realize that often you’re already in pain when you visit. That’s why they are gentle, using a precise adjustment to help remove your pain. They’ll talk to you and show you how it can feel so you know what to expect, making sure you’re comfortable along the way. We primarily utilize techniques such as Toggle Recoil, Diversified, Thompson, Impulse Adjusting and Gonstead. Dr. Brad has additional training with Advanced Soft Tissue treatment and Flexion Distraction. Many people come to us for immediate relief of their symptoms. We will work with you to resolve your pain as quickly and effectively as possible. While chiropractic care can help you fix your problem, regular care is what helps you stay well – just as you go to the dentist regularly to maintain good oral health. Receiving chiropractic care can help your body stay in motion so that you can enjoy a great childhood, adulthood and retirement! Our goal is to help you stay active and well, enjoying every day of your life, whether you are young or older. To learn more about us and to schedule an appointment, contact us today!